Recent release “The Burning Bush Gospel Messages Vol. II” from Page Publishing author Wiley Toston is a magnetic book about faith and spirituality through the guidance of the Holy Bible. Wiley Toston, a graduate of Tennessee School of Religion with a BA degree, a master’s degree, and a doctor of law degree, as well as a recipient of an honorary doctorate, has completed his new book “The Burning Bush Gospel Messages Vol. II”: a potent account that explains God’s message written across the pages of the Holy Writ. Published by New York City-based Page Publishing, Wiley Toston’s absorbing opus proclaims a wonderful message of hope and inspiration for the future of Christian fellowship and worship. 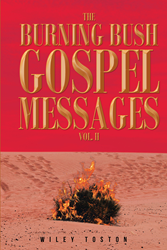 Readers who wish to experience this religious work can purchase “The Burning Bush Gospel Messages Vol. II” at bookstores everywhere, or online at the Apple iTunes store, Amazon, Google Play, or Barnes and Noble.